Marilla of Green Gables, the latest novel from American author Sarah McCoy, imagines the life of Marilla Cuthbert before Anne Shirley's arrival. The novel endeavours to liberate Marilla from the confines of Green Gables, expanding upon details of her life which Montgomery merely alludes to––such as her relationship with John Blythe. Fellow novelist Lisa Wingate calls McCoy's book a "beautiful rendering of a beloved place, a complex woman, and a long-ago time. . . . A must-read for anyone who adored Anne and ever wondered, what came before?" McCoy was in Charlottetown on October 20 and 21 to promote the novel. 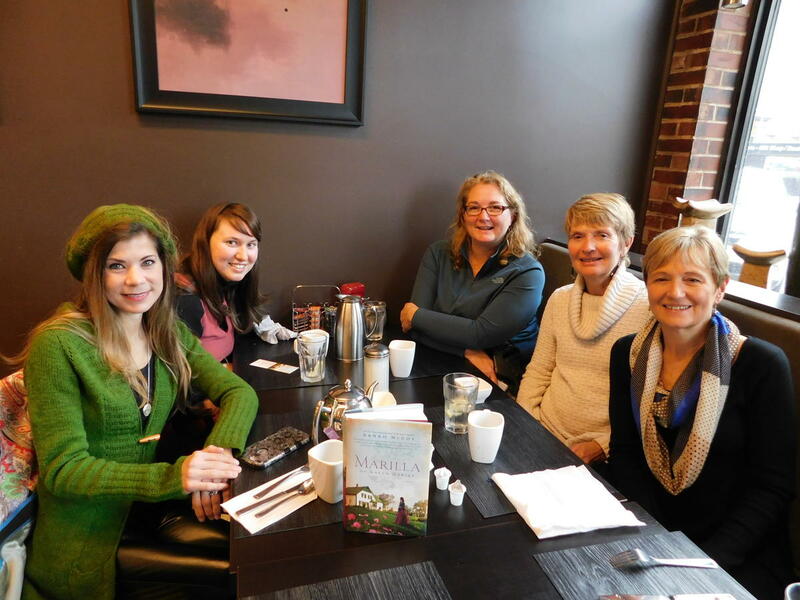 Saturday, October 20 began with brunch at Casa Mia Café in downtown Charlottetown. Attendees included Marlene MacDonald and Lori Cheverie from Bookmark Charlottetown, Dr. Rosemary Herbert from the Institute, guest of honour Sarah McCoy, and myself––a UPEI student and aspiring Montgomery scholar. We discussed everything from the weather to themes of paganism in Montgomery's work. Mostly, however, we talked about McCoy's process, and the time she spent in PEI and Nova Scotia doing research for the novel. Although McCoy has spent much time exploring the north shore of the Island, this was her first time in Charlottetown, and she seemed genuinely charmed by our quaint city. 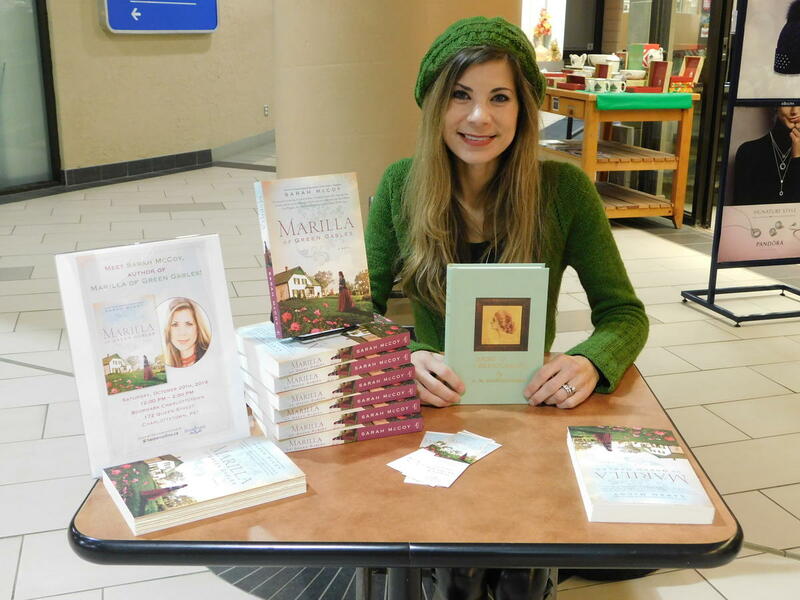 At noon, Bookmark officially launched Marilla of Green Gables and McCoy began signing copies. There was a steady stream of visitors to her table, many of them taking photos and buying multiple copies for their families and friends. McCoy took the time to chat with everyone, and both her energy and excitement were visibly contagious. Familiar faces included Pam Campbell from the Anne of Green Gables Museum at Silver Bush. According to McCoy, the most nerve-wracking part of the novel-writing process was seeking the approval of Montgomery's relatives, such as the Campbells. Fortunately, Pam Campbell seemed delighted with the book and even more delighted to see McCoy herself. Later that day, McCoy signed copies of the novel at the Anne of Green Gables Store in Charlottetown, and on Sunday there was a similar event held at the local Indigo. On October 22 she travelled to Halifax, Nova Scotia to begin the process all over again. Marilla of Green Gables is available everywhere October 23. Canadian readers can find it on Amazon, Indigo, or at their favourite local bookstore.